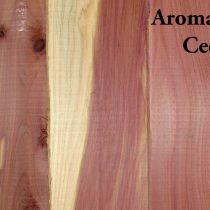 Aromatic cedar, also known as Eastern Red Cedar, is grown in the eastern North American continent. This cedar is known for its distinct smell. It is commonly used in closets and chests to repel moths and other insects. Aromatic cedar trees are common, but slow in growth. Most trees are harvested while the tree is still fairly small in diameter, causing most boards to be knotty and narrow in width. Aromatic cedar is also very resistant to rot, decay and insects, allowing it to be a good source of wood for exterior projects. The heartwood tends to be reddish and brown while the sap wood is pale yellow. Often times, aromatic cedar appears streaked as the sapwood grows throughout the heartwood.